Loose change can be a hassle to deal with sometimes. It clutters your pockets or your purse, and if you do not have a place to keep it, it can be easy to lose track of, too. 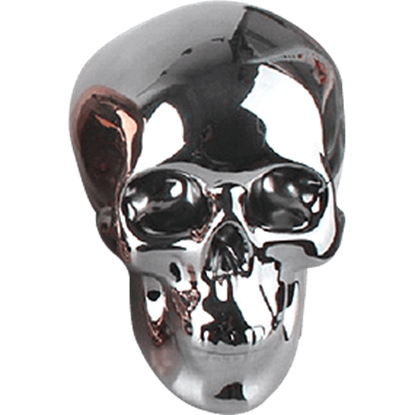 Thankfully, we have a number of skull money banks that can be trusted to keep track of your change and cash while they bring great gothic style to your decor! 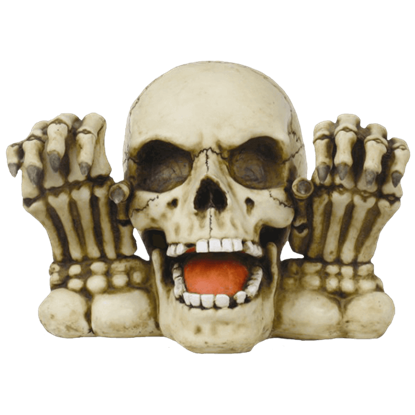 Even better, some of the skulls feature a striking and almost frightening appearance that will serve well in keeping snoopers away from the skull, as well as away from your change. Virtually all of these skull banks depict a skull in one form or the other, but most differ in that they add variations to the skull to make them far more appealing. 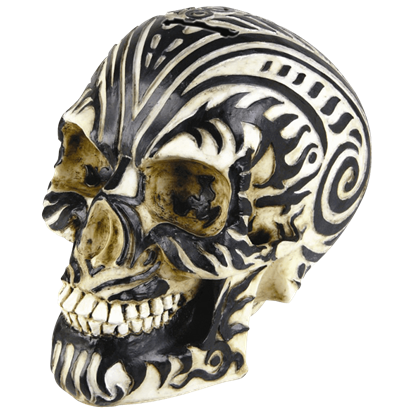 A few are classic skulls with little touches of style, but most are vividly colored and highly stylized. Some feature robotic accents to make the skull look more like a machine than bone, while others feature fire accents, fangs, and brands to create a more demonic and devilish look. Some are adorned with tattoo markings and carvings, which makes for an intricate accent to view. A few are even done up like pirates, which is oddly appropriate, considering how often pirates spent their lives trying acquire ever greater amounts of coin! 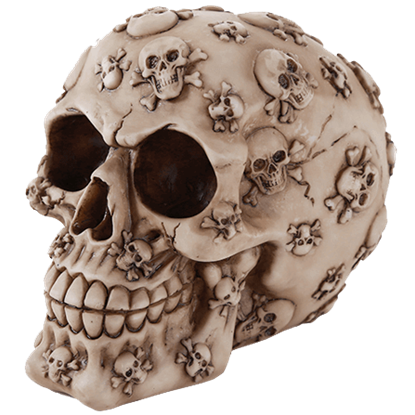 Everyone has got some loose change just floating around, and that gives anyone a good excuse to pick up one of our stunning and intriguing skull money banks! 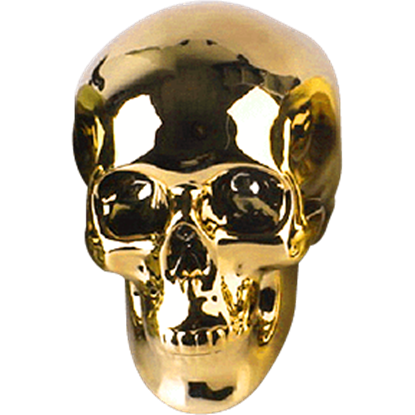 With its wicked grin and shiny surface, the Bronze Skull Money Bank will ward off any would-be scoundrels after your precious treasure. 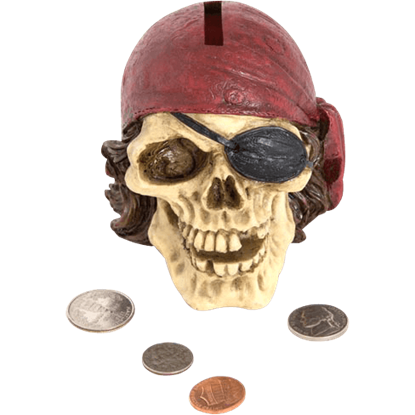 This coin holder skull head is perfect for neatly and stylishly storing your loose change. 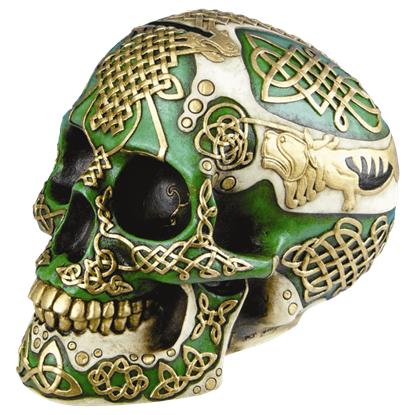 This Celtic Lion Savings Bank is a great addition to any skull collection. Shaped like an ornately decorated human skull, this savings bank creates a regal display while helping you keep your loose change neatly stored away. Place your trust in a gentleman whose reputation is beyond reproach (and beyond the grave). 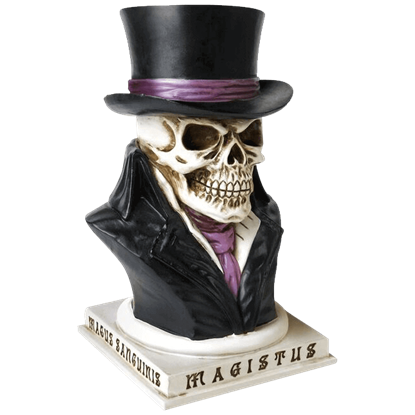 The Count Magistus Money Box displays Albrecht Magistus, a well known but misunderstood aristocratic figure in Victorian London society. A skull with a wicked gleam in its empty sockets and a grin that fears not death suits the tastes of bold buccaneers. Arrayed with the famous emblem of the Jolly Roger, the Crossbones Skull Money Bank is a fine piece for your cabin. There is nothing better than a skull savings bank to keep your money safe. 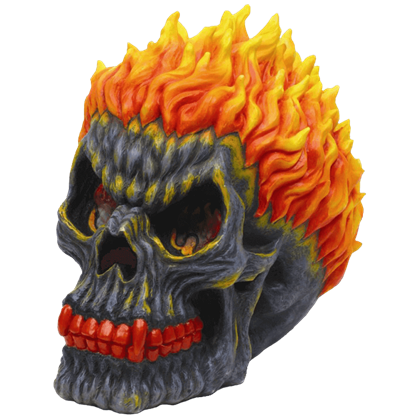 The Fiery Skull Money Bank features a dark skull with red teeth and flaming hair, which looks fearsome enough to safeguard your earnings. What better way to keep your treasured coins away from prying eyes and stored away as savings than placed inside the Gold Skull Money Bank? This metallic tone, ceramic skull head is hollow inside for holding your spare change. Let the Gunmetal Skull Money Bank keep a head count of all your loose change for you! This shiny skull coin bank adds an eye-catching touch of grim style to home decor as both a great conversation piece and a helpful home accent. This Moari Ram Skull savings bank is a great addition to any skull collection. The Moari Ram Skull has Moari tribal designs covering the entire skull. The skull head stores coins or money inside its head. What better way for a pirate to spend the afterlife than as a piggy bank? Our Pirate Skull Piggy Bank comes with a slot in the head for inserting cash and coins. He has an eye-patch and a red bandana making it a stylish decor piece. There is nothing better than a skull savings bank to keep your money safe. 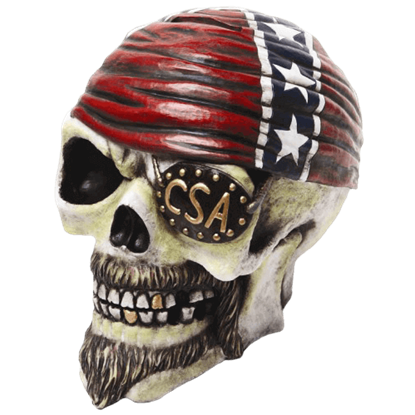 The Rebel Confederate Skull Bank features a skull wearing confederate regalia, which looks more than tough enough to safeguard your earnings. 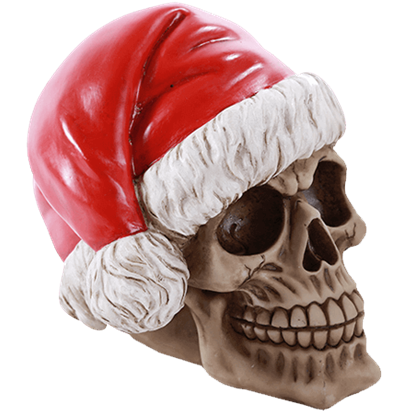 Something about this skull makes one either hum about jolly holly and jingling bells, or mutter a few humbugs. Is it the hat or the merry grin? No matter the time of year, the Santa Skull Money Bank is sure to bring forth smiles. The Scary Skull Money Bank is more than just your average bank to store money in. This gothic figurine has the benefit of providing security for your spare change, too, as the bank does its best to scare away any thieves or robbers.